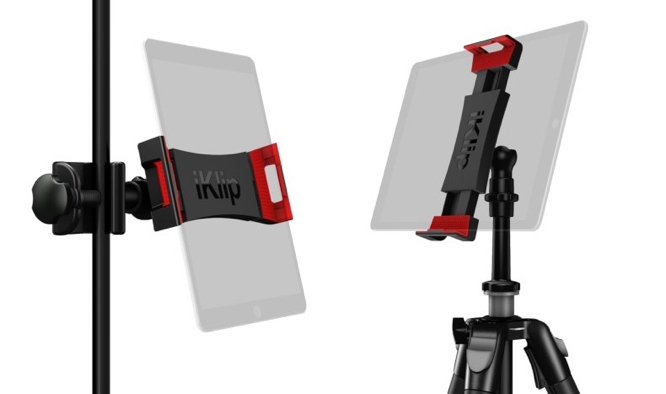 IK Multimedia is expanding its iKlip range of stands and mounts with the new iKlip 3 Series, providing options for mounting any iPad or other tablet model, onto microphone stands, tripods, and more, offering musicians, cinematographers, and other users with a secure and versatile way to keep their iPad close at hand. The iKlip 3 series is available in three configurations: The standard iKlip 3 is designed for microphone stand mounting, and features a newly designed holding bracket with more durable rubber pads and a spring mechanism to allow users to rotate their device to any angle, allowing for convenient mounting pretty much anywhere on a mic stand. iKlip 3 Video is targeted at photographers and cinematographers, offering the same universal tablet support, flexible viewing angles, and rugged design, but with a UNC 1/4”-20 bread for mounting on virtually any camera tripod, monopod, or other mount. iKlip 3 Deluxe provides the best of both worlds and more, with both the mic stand mounting bracket and tripod mounting bracket, essentially giving users five different mounting options in a single package, including mounting directly on top of a mic stand. All of the iKlip 3 stands also now include Velcro strip slots for cable management or easy mounting of the latest iRig interfaces. All three of the new iKlip 3 mounts are available now from the IK Multimedia online store and authorized dealers worldwide.